AMD has made some waves lately with its new Zen architecture and Ryzen processors, offering a line of CPUs with competitive performance to Intel’s Core processors and even more competitive pricing. Now, AMD fans are waiting for the company to make its next move by introducing its next generation Vega GPUs. Until now, AMD hasn’t provided any information on when Vega might be officially introduced, leaving gamers waiting impatiently for stronger competition with Nvidia’s Pascal architecture. 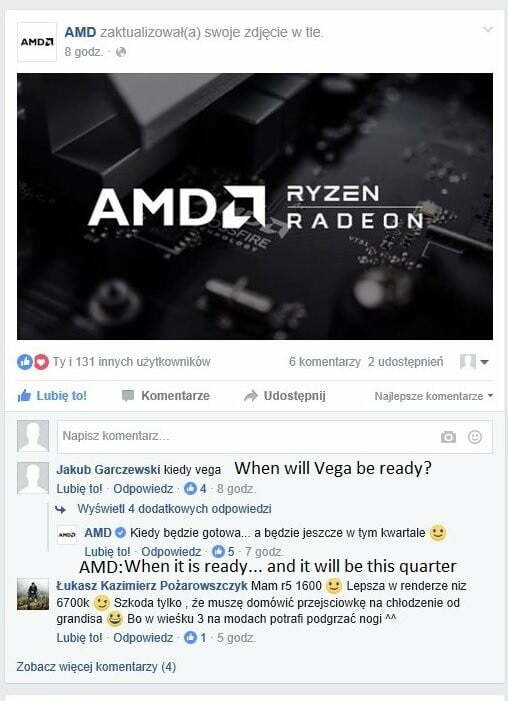 Today, however, it looks like AMD might have let the cat out of the bag, with its AMD Poland Facebook page indicating that Vega will arrive this quarter, as Wccftech.com reports. Of course, it’s entirely possible that someone at AMD Poland spoke out of turn, and so this information should be considered unverified at this point. But there’s other information that seems to confirm an imminent release, such as a Vega GPU showing in CompuBench benchmark results — something that usually happens shortly before a new component is released. In addition, AMD has now provided Vega OpenGL support for Linux, and the company has apparently devoted 80 percent of its driver engineers to Vega optimization for the past few months. Simply put, while nobody knows when Vega will arrive, there’s plenty of evidence to suggest that it’s going to show up in gaming PCs sooner rather than later. By the CompuBench results, Vega will offer at least competitive performance compared to the Nvidia GTX 1080 but significantly lower than the GTX 1080 Ti. Without knowing where in the Vega line the tested GPU is positioned, we don’t know if that’s low-end, midrange, or high-end Vega performance. Nevertheless, AMD fans should have some tantalizing options to choose from. AMD recently released a new Radeon RX 500 Series of GPUs based on its current Polaris generation, and so anyone who wants decent AMD gaming performance without spending serious money has that option to consider. But otherwise, it’s looking like anyone planning on a truly high-end gaming experience won’t have too long to wait before they’ll be able to look outside of Nvidia’s lineup when choosing their next GPU.